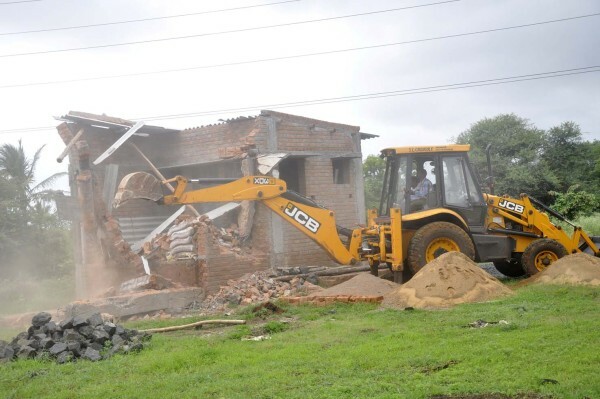 The anti encroachment cell of the corporation under the leadership of Corporation commissioner Ravi Kumar today demolished an unauthorized construction at Kanbargi this morning. The residents opposed this demolition and the situation was tensed a bit when an old man named Chennappa took out a bottle of poison, but the corporation officials acted promptly and averted a disaster. The residents then also did a rasta roko on the Kanbargi- Gokak road. Commissioner Ravi Patil has said that they have intensified the demolition of unauthorized constructions.